2014: A good year to fly the friendly skies? THE MARCH DISAPPEARANCE of Malaysia Airlines Flight 370, a huge, state-of-the-art widebody Boeing 777 jet with 239 souls on board, stands as the greatest aviation mystery of all time. Not a single shred of the airplane or anyone on board has ever been found, nor is there any concrete evidence that it even crashed. It literally disappeared off the face of the planet. For all we know it was abducted by aliens. Then the psychopath Vladimir Putin shot down another Malaysian Airlines 777 over the Ukraine, and another 298 people were gone. And now yet another jetliner, this time an Airbus A320, operating in the same part of the world as Malaysia Air Flight 370 has gone down, though there is no mystery this time as wreckage has already been found. What an extraordinary year for air travel. Jurassic Park (1993), which I saw in its 3D release last night, suffers from slow and incohesive development throughout the first half of the film and too much silliness mixed into the more suspenseful latter portion. There were a few good action sequences — a T-Rex snapping at children through the collapsed glass roof of an SUV stands out, but just as often the movie resorts to implausible scenarios nearly reaching the ridiculousness of Deep Blue Sea. Yet the central liability of this picture does not lie so much within its dull periods, or moments that rendered me incredulous; rather, its most grave shortcoming is that it lacked the true sense of wonder which I expected from the great maestro. Jurassic Park also felt dated, and I don’t mean from the technological point of view. Big Hollywood monster movies and the related superhero genre have been a ubiquitous presence on the cinematic landscape for decades now — I suppose going back to the beginning of film. Having seen a number of these competing movies in the twenty years since Jurassic Park was released has perhaps jaded me; raised my threshold of what constitutes a good monster movie. I imagine at the time it was made, this movie might have been quite cutting edge — but I doubt that too. Why? Alien. 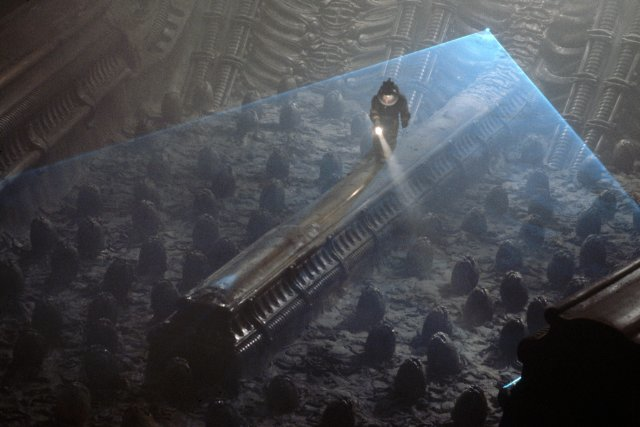 The better movies in the Alien franchise feature monsters that aren’t necessarily so much scarier than those of Jurassic Park. But those movies are so much more frightening. That’s because it does not matter the exact degree of horribleness in which a monster manifests itself — whether a T-Rex or an “Alien” — when either can just as easily kill you. 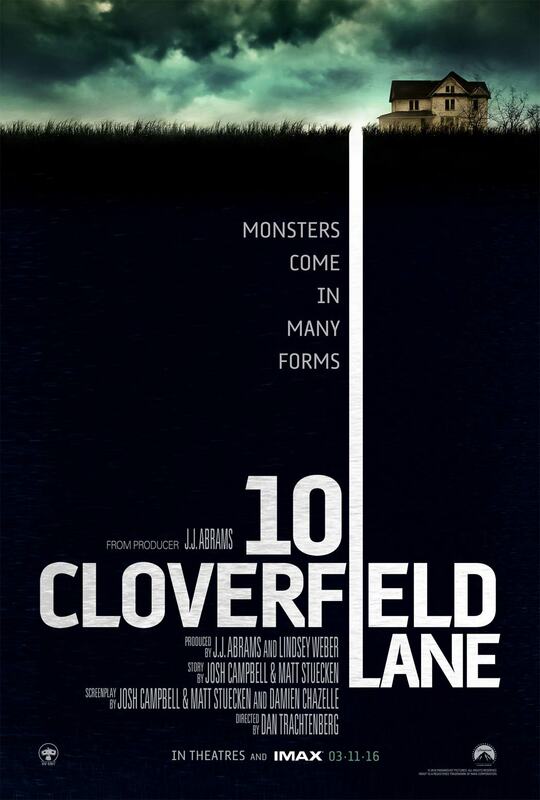 It’s because a good monster movie relies on that old stand-by Hitchcockian idea of building suspense. It’s been a long time since I’ve seen Hitchcock’s Birds movie, but I’m certain he was able to get a lot more out of a few seagulls and crows than Spielberg got out of giant, menacing, teeth-gnashing dinosaurs. Maybe that connects in a way to my comment about Jurassic Park lacking a sense of wonder. This movie was aimed at the lowest common denominator: young kids. It was made as a ‘family picture’, and, as such, seems deliberately dumbed down. There’s nothing wrong with a good, grand family picture. Star Wars, Raiders of the Lost Ark, and Back to the Future are all superb yet available to the same age group that Jurassic Park targets. But they are at the same time great movies, classics that still resonate today with moviegoers of all ages. This brings me to a note about Mr. Spielberg: he has been prolific over the years, but unevenly so. Compare Jaws to Jurassic Park. Close Encounters to Minority Report. Compare his true stories Catch Me If You Can and Lincoln. Not much else to say about that — he’s been very productive but inconsistent. It makes me think again of someone like Stanley Kubrick, who produced one masterpiece after another. 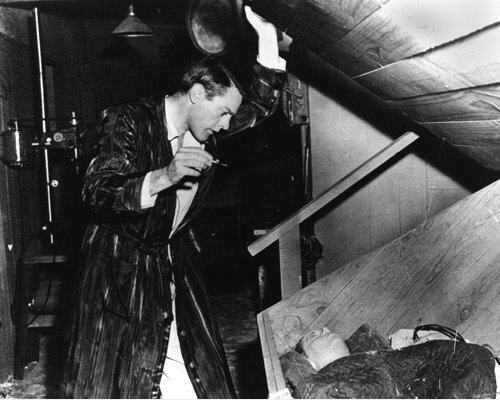 One of the great classic cinematic storylines is that of Invasion of the Body Snatchers (1956). Especially in light of all the recent invading-alien movies (wasteful Battleship and Skyline come to mind), and the related spate of superhero movies (the recent Avengers for example was a yawner), the body snatcher concept shines as a refreshing novelty. The aliens here are much more clever — they don’t want to blow up the White House or generally kill all human beings; rather, they see fit to exploit our resources by taking over each person one by one. As it turns out, and contrary to the Hollywood tradition, there are three tellings of this story which I have seen, and all three are excellent. And watching one in no way should preclude watching the other two. Each of the three are strong and unique enough to hold up on their own and be undiminished by a prior viewing of the others. A while back I had the pleasure of seeing the original 1956 black & white film. This is such a strong thriller of its era that it could be mistaken for a Hitchcock production. If you haven’t seen it, do so. It’s not just the original take, but a great, even masterful film. We would be so lucky if the average big-budget movie of our current era could hold a candle to this exciting classic. Nicole Kidman starred in a remake called The Invasion (2007, also with Daniel Craig). This telling of the story features something of a variant in that Nicole Kidman is the central character, as opposed to the duo-on-the run of 1956. As such, she takes on a more heroic position than the woman in the original: she is a psychiatrist with a doctor friend (Craig) who together can use scientific methods to track down the invading species, all while dodging alien-invaded humanoids and protecting her young son. There’s a certain something about Nicole Kidman in her movies of the past decade that can be off-putting. I’m not sure why, because I love her earlier performances in Dead Calm and Eyes Wide Shut. I think sometimes I sense an artifice about her. Probably I’m just remembering the debacle Australia (2008), as she is a very good actress when called upon to be so. In any case she’s great in this Invasion, a very good and sophisticated personal thriller. The third take on this story is The Faculty (1998), where the invasion is centered at a high school. In this case, a group of young and temperamental students including super-hot Jordana Brewster discover things are amiss with certain people around them, especially their teachers. A highly entertaining take on the Invasion theme, with the added dynamic of growing distrust among the protaganist-group’s members, akin to The Mist (previous post). Boosted by deliciously evil “faculty” and staff performances by Piper Laurie (Twin Peaks), Salma Hayek (who I like here, for a change), Jon Stewart (from the Daily Show and another ensemble piece of 1998, Playing By Heart), and Bebe Neuwirth (Cheers/Frasier) as the principal. A lot of fun. When I think of movies, I think of other movies. That’s how my mind works and I can’t help it. So what comes to mind now? The Matrix, of course. Just a brief plug here. I think I’ll have a future post on the highlights of 1999, and a terrible atrocity called the 72nd Academy Awards. If you haven’t seen The Matrix, I am a little surprised. It’s constantly being shown on TV, but it deserves to be watched start-to-finish uninterrupted. It is a great sci-fi tale and completely essential viewing for movies of the last 15 years. More later on this one. If you haven’t seen it, make sure you watch the original 1999 version. I don’t know that the 2 sequels were poor; in fact they might be quite good. But they cannot match the original ground-breaking Matrix. 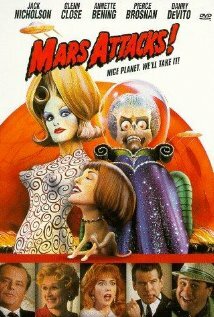 The farce Mars Attacks! (1996) by Tim Burton is an absolute delight. Besides poking good fun at the alien-invasion concept (this time an overt invasion, not the subtle type of the Body Snatcher movies), this movie also succeeds on a dramatic level à la Men In Black I & II, that is, enough of a plot to keep it interesting without getting in the way of the comedy. With a great, all-star cast headlined by Jack Nicholson playing the U.S. President. And The Bygone Era is the 1980s. There were a group of films that came out around the same time period where I see connections. I’ve written of this before, connections of one film to another that others may have not made — connections which would seem tenuous or abstract if you just wrote the titles on a list.